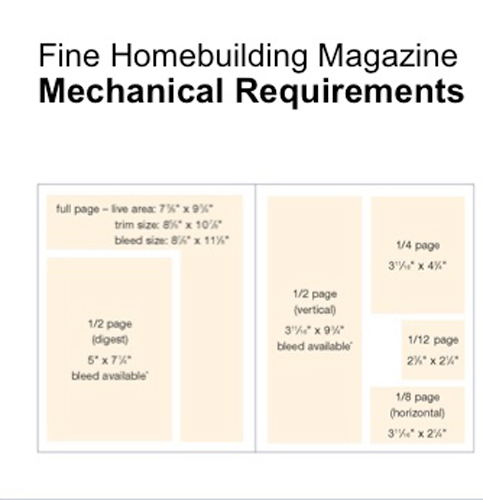 Full-Page/Fractional Ads: We accept digital files only, preferably high resolution, cymk, font-embedded PDF or PDF/X-1a. Ads must be prepared according to our specification guidelines, which are available by contacting the Advertising Coordinator at 866-505-4687 or emailing inquiries to Ads@Taunton.com. All ads must be accompanied by a proof made from the file submitted to verify content. Color ads must be accompanied by a high-quality, full resolution color proof calibrated to SWOP specifications. For black & white ads without halftone images, a high-quality computer printout (600 dpi or greater) is acceptable. We reserve the right to charge for processing time in the event the file does not meet ad specification guidelines. 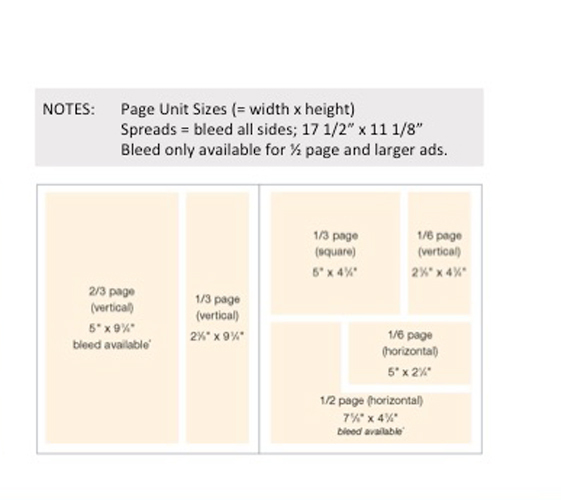 All ads must reach the size of the space ordered at some point in width and height. 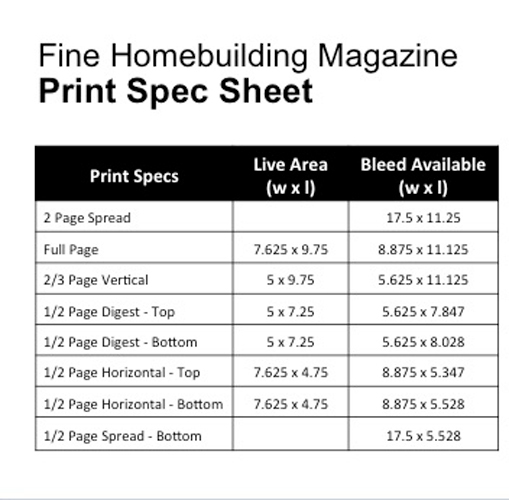 Bleed available only for ½ page and larger. Bleed image should be limited to tints or background. 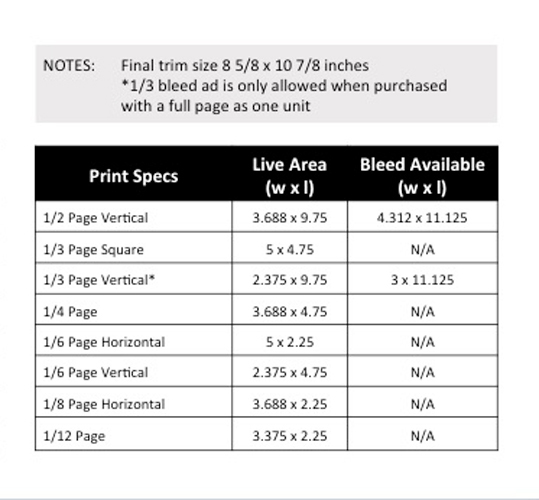 Live matter, including type, must be kept within the live area, which starts 5/8” from top, ¾” from bottom, 5/8” from left, and 5/8” from right of the bleed ad size. In-house production services are available for an additional charge and they are non-commissionable. Contact the Advertising Coordinator for details. Please note: All publication services will be billed at trade rates. Ads requiring work by the Publisher may not qualify for the camera-ready discount. Deadline for Publisher-set copy is 7 days prior to closing date. Position Requests considered but not guaranteed.